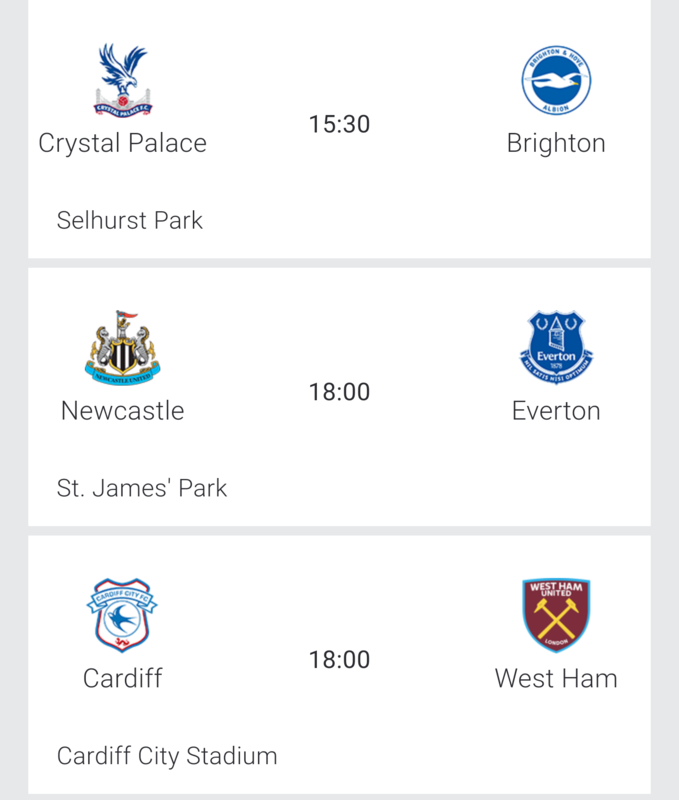 Crystal Palace manager Roy Hodgson has an unchanged squad for Saturday’s fixture against fierce rivals Brighton & Hove Albion. Pape Souare is not ready to return from a dislocated shoulder, while Mamadou Sakho has had a knee operation. Brighton midfielder Pascal Gross remains out with a hamstring injury but he could be fit for the FA Cup quarter-final at Millwall on 17 March. Leon Balogun has resumed training following a shoulder problem. Crystal Palace have won six and lost just one of the last nine home meetings in all competitions. However, Brighton could complete the league double over Palace for the first time since 1983-84, when they met in the second tier. West Ham have won the last seven meetings with Cardiff, in league and cup and scored at least twice in each game. Cardiff’s only victory in nine versus the Hammers was 1-0 away in the Championship in August 2011. The Bluebirds’ solitary home win in the past 11 attempts against West Ham came in the Championship at Ninian Park in November 2004. Cardiff central defender Sol Bamba will miss the rest of the season with a ruptured anterior cruciate ligament. Bruno Ecuele Manga is expected to start in his place, with Harry Arter and Josh Murphy both hoping to win recalls. West Ham are boosted by the return of Aaron Cresswell and Fabian Balbuena, while Manuel Lanzini has shown no ill-effects after his comeback last week. Jack Wilshere, Winston Reid, Carlos Sanchez and Andriy Yarmolenko are long-term absentees. 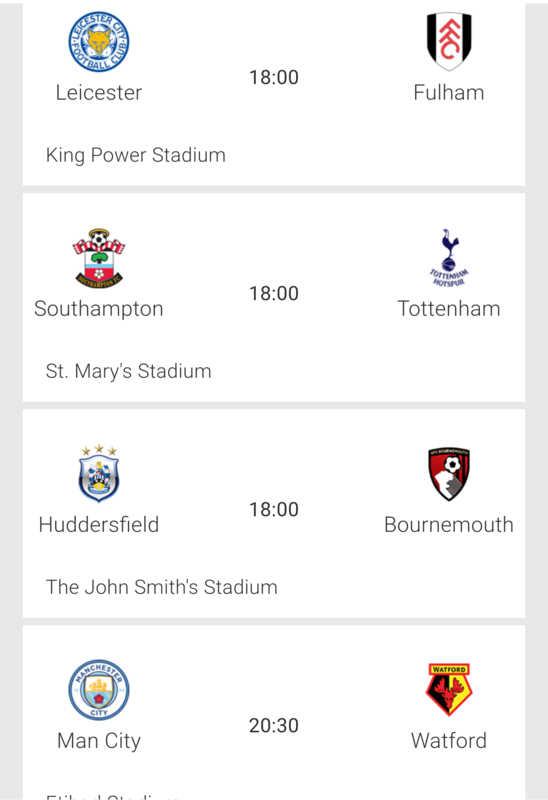 Jonathan Hogg has become Huddersfield’s latest absentee because of the rib injury he suffered against Brighton.Laurent Depoitre is a major doubt with a foot problem, while Demeaco Duhaney, Adama Diakhaby and Isaac Mbenza remain sidelined and Tommy Smith is banned. Bournemouth are assessing top scorer Callum Wilson, who has returned to training following a knee injury. Jefferson Lerma is back after a two-game ban but Dominic Solanke, Junior Stanislas and Steve Cook remain out. Bournemouth have scored in the last 13 meetings in all competitions, and have won four of the last six (D1, L1). All three Premier League encounters have been won by the home side, with Bournemouth 2-1 victors in December’s reverse fixture. The three most recent league meetings between the sides at the John Smith’s Stadium have produced a total of 15 goals. Leicester’s Jamie Vardy is fit despite needing stitches in his tongue after a clash of heads in the loss at Watford. Marc Albrighton and Daniel Amartey remain sidelined with respective hamstring and ankle injuries. Fulham have no fresh injury problems. Forward Andre Schurrle is still out with a virus, although the German could be ready to return next week. Alfie Mawson is recovering from knee surgery and hopes to be back playing before the end of the season. Leicester haven’t won any of the five Premier League meetings, scoring just once in those games (D3, L2). Four of the past five encounters have been in cup competitions, with the teams also drawing 1-1 in the Premier League in December. Newcastle have lost five of the past six Premier League meetings, including successive defeats at St James’ Park. Their only win against Everton in the last 12 top-flight encounters was by 3-2 at home in December 2014. There have been an unsurpassed 18 goals from penalties in this Premier League fixture. Newcastle midfielder Sean Longstaff is likely to miss the rest of the season with a knee ligament injury. Defender Ciaran Clark and goalkeeper Rob Elliot remain sidelined with respective knee and back injuries. Everton’s Phil Jagielka, who has been struggling with injury this season, was on the bench last weekend but is a doubt after missing a couple of training sessions this week. Fellow defender Leighton Baines remains sidelined with a back injury. Tottenham must be riding high on confidence especially after reaching the Champions League quarter finals. However, back home, things are not going according to plan. Mauricio Pochetino’s side are winless in three and sit only a loss away from being dragged into the battle for 4th, the last things Spurs surely need at this stage. Southampton have decided not to risk top scorer Danny Ings, who will instead be given until their following game in three weeks to build up his fitness after a hamstring injury. Mario Lemina is nearing a return after abdominal surgery. Tottenham’s Dele Alli could be involved for the first time since suffering a hamstring strain seven weeks ago.Harry Winks is a doubt with a recurring groin problem, while Eric Dier returned from tonsillitis to play on Tuesday. Kieran Trippier missed that Champions League win in Dortmund because of a muscle strain and his fitness will be assessed. Southampton are winless in their six home league games against Spurs since returning to the Premier League in 2012 (D2, L4). Tottenham have lost just one of the last 13 Premier League meetings, at White Hart Lane in May 2016, and scored in every fixture (W10, D2). City are back on top of the League after spending close to three months in second. They are winning games again although not as convincingly as their manager would want. Nevertheless, Pep Guardiola would take retaining the title with less fancy football especially after how difficult this season has been and more so the brilliance of Liverpool who are only a point behind the Cityzens. With a Champions League Round of 16 return leg at home to Schalkh 04 coming up next week, City may rest one or tqo players but who cares, after all they have the biggest squad in the division. Kevin de Bruyne misses out after suffering a hamstring injury during Manchester City’s win at Bournemouth. John Stones and Fernandinho are also sidelined but Aymeric Laporte could be fit for the first time since the Carabao Cup final. Watford pair Kiko Femenia and Sebastian Prodl are available, meaning head coach Javi Gracia has a fully-fit squad. Femenia missed the win over Leicester through illness and Prodl has recovered from knee and hamstring injuries. Manchester City have never lost a Premier League game against Watford (W7, D2), winning the last seven in a row by an aggregate score of 22-3. In all competitions, Watford have lost their last nine meetings with Manchester City and are winless in 14 since a 1-0 home victory in the second tier on 4 March 1989. Liverpool are bottling it again! That are some of the views that people around the club are sharing after Liverpool have won only two of their last 6 and subsequently dropped into second, a point behind City with 9 games to play. I don’t think they have choked again, at least no yet but they are in a poor run of form which needs to end as soon as possible, if they are to qin a first League title since 1991. But they also have Champions League football away to Bayern next week, to worry about which complicates matters further. Dejan Lovren could be available for Liverpool on Sunday after two months out with a hamstring injury, while James Milner is expected to be fit. Alex Oxlade-Chamberlain, sidelined since April by a serious knee injury, makes his playing comeback for the under-23 side at Derby on Friday. Burnley have no fresh injury concerns ahead of the trip to Anfield. Aaron Lennon is not yet ready to return, while Jonathan Walters and Steven Defour are long-term absentees. Liverpool are unbeaten in their last 11 home league games against Burnley, winning nine of those matches. Burnley’s last win at Anfield came in the top flight in September 1974. The Clarets have picked up just four points from a possible 27 against Liverpool in Premier League meetings. Stamford Bridge at least now feels a calmer place to be in especially after two wins in a row, one in the League and other in Europe, following the League Cup loss to Man City which was headlined by the Kepa Arrizabalaga incident. 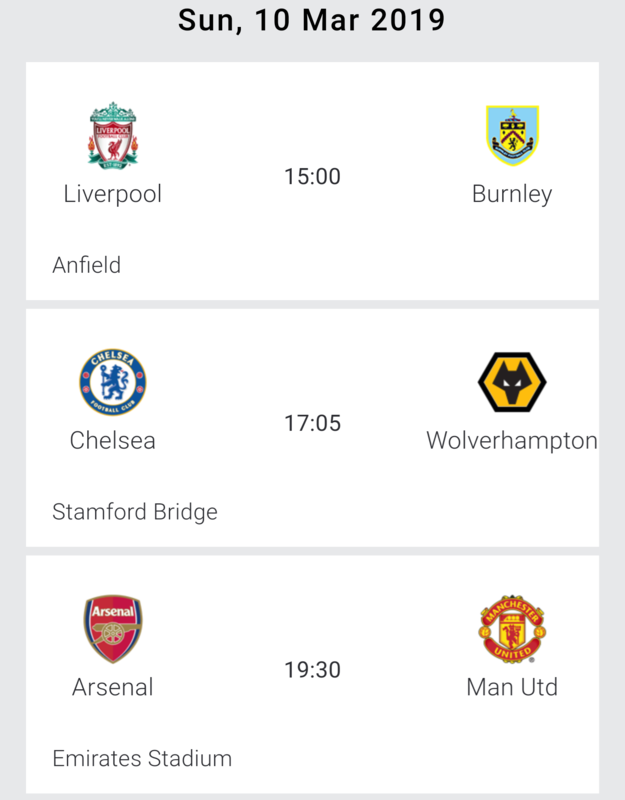 The team looks to have moved on from that and will be eager to make it three wins on the trot in all competitions when they host a stubborn Wolves side, one which is seeking a rare double over Chelsea, having defeated the Blues 2-1 in the first round. Chelsea head coach Maurizio Sarri will again rotate his squad for the Wolves fixture, which is sandwiched between two Europa League games. Among those rested against Dynamo Kiev were Eden Hazard, N’Golo Kante, Cesar Azpilicueta and Antonio Rudiger. Chelsea have registered six successive home wins against Wolves in all competitions, scoring 21 goals and conceding just two. Wolves could earn their first league double over Chelsea since 1974-75, when the Blues were relegated from the top flight. How times change! Just over a decade ago, these two sides were fighting for the League title but not anymore. On Sunday afternoon, Arsenal and Man United will be fighting for 4th place, the last available spot for Champions football next season. There is a different feel inside the two camps with Arsenal are coming off a 3-1 loss away to Rennes in the Europa League while United were at the right end of a similar result on Wednesday as they somehow made it to the last 8 of the Champions League at the expense of PSG. However, fixtures between these two sides are usually not easy to call despite United dominating them in recent years. Arsenal’s Lucas Torreira begins a three-game ban after losing an appeal against his dismissal versus Tottenham. Striker Alexandre Lacazette returns after missing Thursday’s Europa League defeat in Rennes through suspension. Anthony Martial is available after a groin injury for Manchester United, who were without 10 players against Paris St-Germain in midweek. Eric Bailly has recovered from a heavy challenge in that game, while Nemanja Matic and Ander Herrera could be fit. Paul Pogba is available after serving a European suspension. Arsenal are unbeaten in their last 14 home league games (W12, D2), winning the last eight. Their three defeats in the previous 41 top-flight matches at the Emirates Stadium all came against the two Manchester clubs: two versus City, one against United. Arsenal have earned 38 Premier League points at home this season, a tally exceeded only by Manchester City’s 42. The Gunners have taken nine points from eight games against established top-six rivals this season (W2, D3, L4). They earned just six points in total in such matches last term. Unai Emery is looking to become the first Arsenal boss to avoid defeat in his first two top-flight meetings with Manchester United since George Swindin in 1958-59. Laurent Koscielny is set for his 250th Premier League appearance. Alexandre Lacazette can become the second Arsenal player to score in six consecutive home Premier League games. Thierry Henry did so twice at Highbury. United are chasing a seventh consecutive away league win, a feat they last achieved in 1993. The Reds are on a club record run of nine successive away victories in all competitions. They are undefeated in 12 league matches (W10, D2), the longest current unbeaten run in the top flight. Paul Pogba has missed three Premier League penalties this season (although he scored one of those on the rebound) – no player has ever missed four spot-kicks in a single season. Ole Gunnar Solskjaer could become the first Manchester United manager to win his first two away games against Arsenal in all competitions. Chris Smalling is set for his 200th Premier League appearance for the club. He also played 13 times in the division for Fulham.